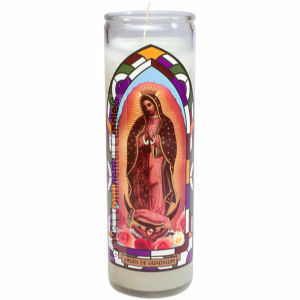 Virgin De Guadalupe with vanilla scent, has its origin in Mexico and its date of celebration is December 12th. When lit, this candle omits vanilla scent through out the room. This is one of Sanctuary Series® Candles manufactured by Continental Candle Company. Only Sanctuary Series® feature the copyrighted stained glass window design that simulates the effect of light shining through a stained glass window. Manufactured using quality wax and a 100% cotton wick.